Do you want more referrals? Have you asked your social media connections for help? Targeting is important in every area of marketing. Every company has a different target audience so it makes sense to adapt your tactics and target your specific prospects on the social platform they visit most. 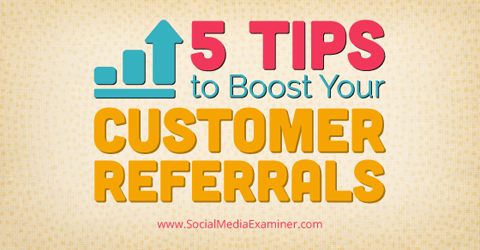 Discover how to boost customer referrals from social media. Not every social network’s audience is the same—research which platform works best for your business. For example, while Facebook works great for attracting individual consumers, LinkedIn is often better for B2B products or services. Test a few social platforms to see which one is most successful for you. Come up with a plan that encompasses all of your various audiences and segments, and then create different invite/referral programs for each. When you find what works, ask customers to share on that channel. According to Nielsen’s Trust in Advertising Report, 84% of consumers say their friends and family are their trusted resources. Any referrals coming from a trusted resource are persuasive because it’s social proof that your friend believes something is worth noting. Think about it. If a friend tells you about a new store she went to that she thought you would like, there’s a good chance you’ll check it out for yourself when you have time. When a recommendation comes to you directly from a friend, that social proof has a heavy influence on your behavior. 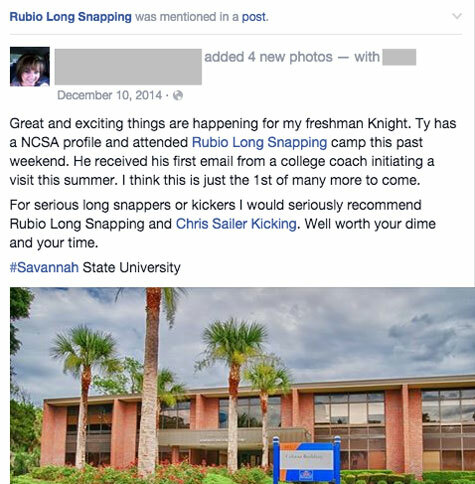 Mentions like this one for Rubio Long Snapping and Chris Sailer Kicking create valuable social proof. That influence doesn’t change online. Active social media users are already sharing on a regular basis, and their friends, family, colleagues and followers see those shares and take them into consideration. When an invite to check out a page or business online comes from a trusted resource, the potential new customer is significantly more likely to check it out and continue on to the next step in the purchase process. If you can entice your customers to share your product or service with their network, you can use the power of social proof to grow your business. To encourage users to provide social proof, offer them an incentive. Everyone loves a good promotion and there are so many ways to offer them. For example, you can offer a discount on the next purchase or give a free gift with purchase. Beyond the Rack offers a $10 shopping credit when customers invite a friend to sign up (e.g., become a fan, subscribe to a newsletter, etc.) and that friend follows through. If someone is satisfied with your product and thinks their friends would like it, why wouldn’t they share to get a coupon? Dropbox increased the number of referrals by offering something useful to their current customers. When Dropbox users refer a new customer, they receive 500MB of free storage.According to Drew Houston, this incentive grew Dropbox signups by 60%. The cost of offering an incentive is minimal if it means gaining a new customer. If you deliver customer satisfaction, you end up with more happy customers who may also share their experience with their social network and refer even more customers to you. Before you settle on a single incentive, do some A/B testing to see what results in the highest return. When you ask your customers to share, make it as easy as possible for them to do so.Have a pre-made message ready to go so they don’t have to spend time coming up with their own. Do the heavy lifting so your customers can share quickly and easily. When creating these pre-populated messages, avoid being generic. Would you click through and support a company with a message like “This is our product, it is good, please buy it”? I’m betting no. Avoid the boring and go for the creative. What you say and how you say it counts so make your message interesting. 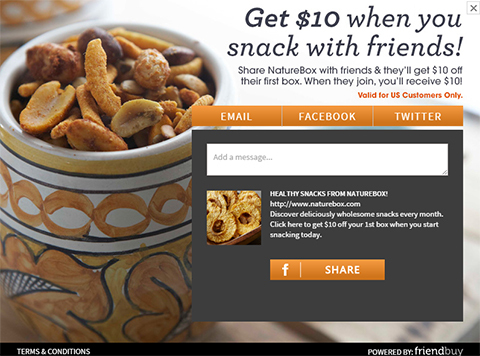 NatureBox, a monthly snack box subscription business, is really good at crafting messages customers are happy to share. The company includes attractive photos that make the post more appealing and their content makes a customer’s extended network want to check it out! Do you remember when Pinterest was by invitation only? You couldn’t just sign up for an account—you had to use a referral code from a friend. When I was able to offer an invite to my friends, I was the hero who helped them get into the exclusive platform. The friends I invited felt special. Requiring a friend invite in order to join something does two things. First, it encourages users to share your site (providing social proof and extending your reach). Second, it creates exclusivity, which people love. Invitation-only opportunities create a feeling of exclusivity for users. Image: Shutterstock. Once Pinterest was established and had created buzz through those initial exclusive accounts, the platform was able to maintain its momentum when it opened its doors to everyone. Even though it wasn’t exclusive anymore, existing users still felt special because they’d been part of a select group that had a sneak peek. It’s important to be subtle when asking for customer referrals. 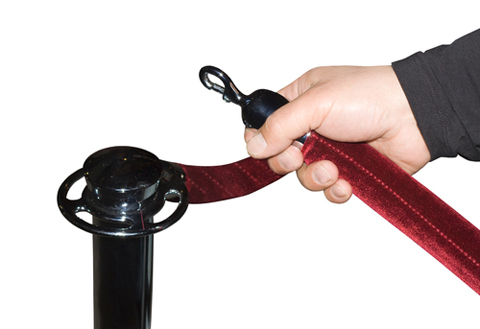 Your customers are more likely to share if you don’t come off as intrusive. Offer high-quality incentives to get the ball rolling. Constant testing and optimization makes your social referral plan successful. You can test where you ask customers to share, which networks are most successful, the incentives that you offer and any other factors involved to ensure that you’re getting the most benefits from your efforts.